The Diary of Anne Frank was a specific recounting of a specific time in world history. But it wouldn’t be timeless if that was all. Young Miss Frank’s personal musings was about every girl growing up in the 1940s. 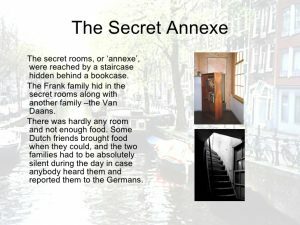 The fact that it took place while the author was huddled in a corner attic hiding from the Gestapo is important, to be sure, but not everything about this tale. She ponders, in her advanced-for-her-age writing style, the experience of growing into a young woman. How it feels to have a first crush. How to live in a multi-generational and enforced quiet community when everything about you wants to jump and play. The story of Anne, Margot, the Franks and the Van Daan’s is classic, but in the United States of America today stories of migrant children with numbers on their arms at our southern border gives one pause. Has anything actually changed? Can anything actually change? The cold, cruel reality makes Paradise Theatre’s “The Diary of Anne Frank” a must-see from a theater that deserves your patronage and your support. Director Jeff Richards chose newcomer Emily Williams for the titular role, and they fell into a mutual pot of good luck when Miss Williams auditioned. His skill in bringing out the best in her, and her natural stage spark makes for a beautiful collaboration. A young female teen can go from “happier than I’ll ever be again” to morose and back again faster than a Lamborghini gets across an intersection. (Can I get an Amen from the parents in the crowd?) Miss Williams shows all of that range, carries a grown-up sized amount of dialogue, and never misses a beat. She was great Saturday night, and the memory of her performance a day later only shines a brighter light on her star turn. The parents Frank are played by Rex Davison and Amanda Gardner. At no time do they believe this is a grand adventure (as Anne called it once), for they know that hate can be at the door any minute. Mr. Davison’s brow furrows throughout, yet the heroism and love for family in Mr. Frank’s behavior shows through in fine fashion. Mrs. Frank had a difficult time holding it together, and Ms. Gardner’s portrayal of a woman at the end of her rope was stellar! Jaqi Westeren plays Anne’s sister Margo in this production. Even at a young age, Miss Westeren is a veteran of Paradise Theatre’s moving (more on that in a minute) stage. This isn’t the closest thing Jaqi Westeren has had to a lead role, but it may be her finest performance yet and she will lead a cast one day soon. Margot and Anne are quite different, and the differences are highlighted by Emily Williams and Jaqi Westeren’s performances. Gig Harbor area audiences continue to appreciate the strides the strong, young performer is making as she builds a formidable stage resume’. Veteran Paradise mainstay Troy Turnley plays Mr. Van Daan, and Mary Lou Mills plays Mrs. Van Daan. They were fine in the first act, but it was in Act Two that they turned on the acting jets and made the audience sit up and take notice. Mr. Turnley’s character’s despair was that much more apparent because it takes place at the very feet of the audience in this stage configuration. Ms. Mills breaks the audience’s heart as her heart is breaking when she tries to raise her husband’s spirits by reminding him when they kissed…and kissed, and kissed in their early days together. That scene was one of the best scenes in local theater this year. Joe Stephens is probably a suave man-about-town, but he plays the socially awkward Peter Van Daan to a tee. It’s a role that could easily turn into parody, but Mr. Stephens handles the part with skill. In smaller roles, Jeff Richards (pinch hitting Saturday night forSteven Bailey as Mr. Dussell and Chelsea Pedro’s Miep Gies are vital cogs in the show’s machinery. This is Mr. Bailey’s maiden voyage with Paradise, and he does a great job. Ms. Pedro continues to grow as an actor with every role she takes, and her Miep was a heartfelt performance in a heartfelt role. ‘The Diary of Anne Frank” isn’t a musical by any stretch, but there are sound and musical components as background and scene setting. Local actor and narration specialist Gary Chambers set the scene with chilling “news” reports. Sound designer Kim Myers set the sound scene with skill. Paradise Theatre’s will to survive and thrive is one of local theater’s great dramas in real-life. They haven’t had a permanent home in recent memory. Yet they continue to produce great shows in whatever setting they find themselves. “Hey, gang, let’s put on a show and we’ll do it…THERE!” That’s community theater as it was on the American frontier and Paradise is reliving the frontier experience. They deserve all of the tangible support it can get. If there is an angel within the reach of my keyboard, contact Paradise Theatre and make their joy complete. Because, they do theater joyfully and deserve some of their own joy in return. Contact the theater website or just show up at a performance of Anne Frank (address below) with a big check. Either way works. 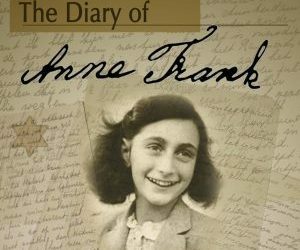 “The Diary of Anne Frank,” by Frances Goodrich and Albert Hacket, Paradise Theatre, 8205 86th Ave. NW, Gig Harbor, Fri-Sat. 7:30, Sat. 2 pm, through Jan. 26. Tickets: https://paradisetheatre.thundertix.com/events/143307. Info: paradise theatre.org, or PO BOX 4, Gig Harbor, WA 98335.